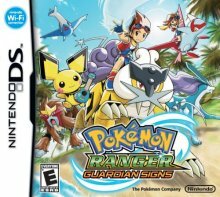 Pokémon Ranger - Guardian Signs is the third in the Pokémon Ranger sub-series of games. Like the previous games, you take control of a Pokémon Ranger whom befriends Pokémon with their Capture Styler to help them pass natural obstacles and defeat an evil team. This game continues with set mechanics but adds more such as the ability to call Pokémon by drawing the Guardian Signs. In addition to that, the Pokémon assist in the field with the PokéAssists. It is also the first Pokémon Ranger game to feature multiplayer modes. Specifically, you face your friends in a variety of Capture Challenges. This game is set in the Oblivia Region which is an island rage that features a large variety of Pokémon and has you ending up facing a team called Pokémon Pinchers, whom naturally are kidnapping Pokémon for the quad team known as the Societea.